(Phys.org) —Scientists say "Li-Fi," Wi-fi connectivity from a light bulb, is making new advancements. Chi Nan, information technology professor at Shanghai's Fudan University, at work with a research team of scientists from Shanghai Institute of Technical Physics at the Chinese Academy of Sciences, spoke to the official news agency Xinhua about the progress. 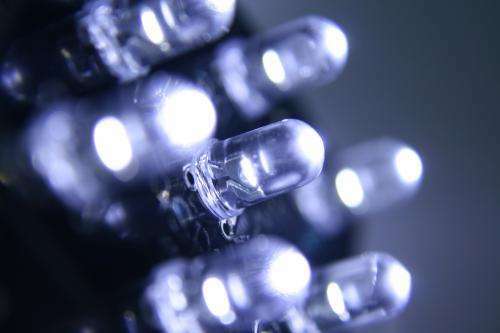 The news, posted on October 17, is that a microchipped bulb can produce data speeds of up to 150 megabits per second (Mbps), which is faster than the average broadband connection in China. She said it would take only a one-watt light emitting diode (LED) lightbulb to connect four computers to the Internet, based on the principle that light can be used as a carrier instead of traditional radio frequencies. Her team hopes to present Li-Fi kits at the China International Industry Fair, an event that focuses on new industries, in Shanghai next month. Those advancements are to be taken within reason that the technology, she said, remains in its infancy; microchip design and optical communication controls would need more attention before there is any conversation about mass-market Li-Fi. Data rates as fast as 150 megabits per second were achieved with the new Li-Fi connection, according to the Xinhua report, which was headlined "Chinese scientists achieve Internet access through lightbulbs" and announced that the scientists' experiments "indicated the possibility of the country's netizens getting online through signals sent by lightbulbs (LiFi), instead of WiFi." Chinese people are replacing the old-fashioned incandescent bulbs with LED lightbulbs at a fast pace, said the agency.To be sure, many observers recognize that, in theory, this would be a step forward as a cheaper and more efficient means of connectivity than wireless radio systems, given that LED bulbs are expected to become dominant over the next 20 years, and the lighting infrastructure is already in place. By altering the length of the flickers, scientists have explored the possibility of sending digital information to adapted PCs and other electronic devices. Li-Fi is a term referring to "light fidelity" coined by Prof. Harald Haas from the University of Edinburgh and refers to a type of visible light communication (VLC) technology that delivers a networked, mobile, high-speed communication solution. He set up a private company, PureVLC, to continue exploring the technology. As for reactions to the report from China, a spokesperson, according to the BBC, said they thus far had not seen any evidence such as videos or photos in support of the claims. PureVLC spokesman Nikola Serafimovski said they did not know how valid was the report "without seeing more evidence." In 2011, Haas demonstrated how an LED bulb equipped with signal processing technology could stream a high-definition video to a computer. Haas performed the first public demonstration of visible light communications live at TED Global, where he showed an angle poise lamp fitted with an LED bulb transmitting high-definition video displayed on a screen. When he interrupted the light with his hand, the video froze and it was then restored when he removed his hand. Bidirectional communication is established how? With an uplink speed of what? How resilient under non-optimal conditions, like being in a shadow, or receiving multiple paths, or simply having lots of other light present (noise)? Does this system require line of sight? How secure is the signal, can anybody who can see the light being transmitted interpret the data being sent? only streaming video/data to a lot of people in the same area seems a good solution, everything else, I don't see it. Unless other lights flicker at a comparable frequency (which they don't) there is no noise. Bidirectional communication is established how? Having an LED on your computer in line of sight of a receiver. But since upload speed is usually much less important than download speed you can forego that and use 'traditional' methods in that direction if you want to. It uses less power than a WiFi.